Welcome to SUMMER ROSE LADY! I am Ann, and I delight in making beautiful and unusual jewelry for the special buyer who prizes one of a kind and collectable treasures. I have been fortunate to travel widely, Morocco, Russia, Central America, Turkey, to name a few, and I always find beautiful and often antique items along the way. 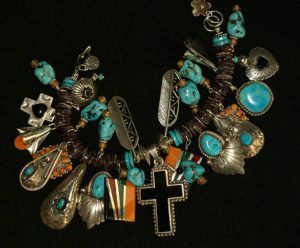 I particularly enjoy and collect the wonderful handmade jewelry made by Native American craftsman, both antique and contemporary, much of it breathtakingly beautiful. History is in every piece these artists make. My interest is in natural stones and findings only lightly modified for wear ability, and in antique, often folk art items from fascinating, little known cultures. I am a third generation artist, mostly in watercolors and oils, and only discovered jewelry twenty years ago. This was a very happy discovery and I have been enjoying it ever since. Please join me! A taste for the unusual and sometimes a bit daring may be somewhat rare, but so rewarding! At present you can see my work here at the SUMMER ROSE LADY website and at Mingei International Folk Art Museum, Balboa Park, San Diego, CA. and at the lovely Prentice Gallery in Mendocino, CA.